Designer's Best Picks: Fresh Finds... Zak Designs!!! 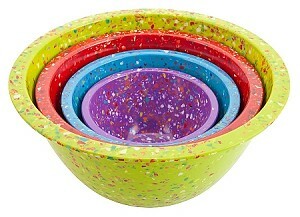 I'm always on the look out for something colorful and fun to add for the home and these bowls from Zak Designs "Confetti" collection caught my eye on Bloomingdales.com. What a way to brighten up your kitchen. Zak Designs does a wide array of kitchen, dinnerware, and children's products all in an effort to make your kitchen and table settings fun, functional, and fashionable. Check out his entire collections at Zak.com and for retailers. Happy Home Shopping!!! Love these! Used together or independently they are fun and funky.